Born in 1960, I have no memories of the first half of the space race, the heady years in the late 1950s and early 1960s, when technology thrust our species to a higher plane, Earth orbit. H-bombs and the Cold War aside, I have a certain nostalgia for the period when engineers, armed with slide rules, built ever-bigger rockets paving the way to the Moon. The dramatic finish of the race, the missions landing a dozen astronauts on the lunar surface, I remember well enough, but what was it like to witness the start, to tune a ham radio to Sputnik 1’s ominous beeping as the satellite sailed overhead? Still, I can get a taste of it: on the Internet, I can listen to the evocative sounds of that first satellite. Movies help feed my nostalgia. One of my favorites, the 1999 film October Sky, captures the early space era from the perspective of a teenage boy growing up in Coalwood, West Virginia. Based on the memoirs of Homer H. Hickam Jr., it’s an inspiring story of how Sputnik’s challenge drew one young American to science. With the same pioneering spirit that gripped professional engineers, Hickam and his friends built surprisingly powerful rockets, one reaching an altitude of 31,000 feet. Like many other amateur rocketeers, he ended up in his dream job, working for NASA, an agency created in response to Sputnik. Another movie, this one available on Google Video, is the U.S. Army’s The Big Picture, lauding the success of America’s first satellite, Explorer I, on January 31, 1958. With all the melodrama of the period’s newsreel films, it reminds us of the deadly seriousness of the Soviet challenge conveyed by officials at the Pentagon. 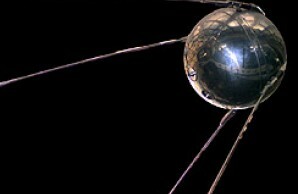 Although Sputnik was the first artificial satellite, it had long been a dream to launch one. Newton had shown, in a simple diagram, how the path of a cannon ball fired with sufficient velocity and altitude would curve around the globe, falling but never reaching the ground. To see how this principle works, try this demonstration created by physicist Fu-Kwun Hwang at the National Taiwan Normal University. Increase the velocity of an imaginary projectile and it eventually circles the planet; increase it too fast and it spins off into space. Another Java applet, which is perhaps more fun to play with, can be found at the physics department at the University of Colorado. Click anywhere in space near the Earth and Moon and you’ll create a tiny white dot representing a satellite. Give it just the right momentum dragging and releasing it parallel to earth’s surface and you’ll put it in a stable orbit. See if you can get a dozen tiny Sputniks circling at the same time. In 1997, for the fortieth anniversary of Sputnik, Web blogger Michael F. Wright created a page dedicated to the first satellite. He begins his compendium of eclectic Sputnik info with a quote from The Americans: The Democratic Experience, by Daniel Boorstin: “Never before had so small and so harmless an object created such consternation.” Interestingly, Wright notes that the U.S.’s Vanguard I satellite, launched on March 17, 1958, may have been beaten into space by Sputnik, but it achieved such a stable orbit that it is now the oldest manmade object in space. It stopped transmitting many years ago, but it is expected to orbit our planet for several hundred more years. What ever became of Sputnik? The Beat Museum in San Francisco has debris on display that may have survived Sputnik’s fiery reentry a few months after its launch. In the predawn hours of December 8, 1957—shortly after the world lost all contact with the satellite—an early-rising railroad worker in Encino California noticed the twisted fragments glowing red hot on the ground near an oak tree in the backyard. 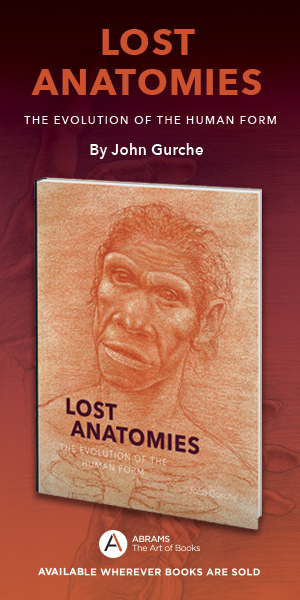 The museum is anxious to resolve the true origins of the debris. (Perhaps the San Francisco-based Myth Busters, known for debunking dubious claims, could check into the matter; it seems like a simple thing to verify.) But regardless, the Beat Museum is a great place to revive the mystery of Sputnik’s fate, given that the Red-baiting “nik” was added counterculture’s “Beat” label. At Inside Smithsonian Research, you can read Donald Smith’s article about the institution’s conservation of early satellites, many of which had earthbound copies made. At the New York Times you can find a collection of Sputnik-related articles from the days immediately after the shock to U.S. national pride. At NASA’s subdued site commemorating the fiftieth anniversary of Sputnik’s launch you can find documents related to the event. Perhaps they should have given the achievement a little more fanfare; as historian Roger D. Launius’s notes in his essay “Sputnik and the Origins of the Space Age,” the tiny satellite led directly to the birth of the civilian space agency, NASA, just a year later. In the spirit of Sputnik’s beep, Sven Grahn of Sollentuna, Sweden, has created Sounds from Space, a Web page celebrating a variety of artificial and human sounds broadcast from Earth and lunar orbit. The revolution launched in 1957 has, above all, changed the way people communicate around the globe. Go to the British site Connected Earth to learn about the rapid evolution from Sputnik to NASA’s Syncom program in 1963, which pioneered satellites in high, geosynchronous orbits. From the surface of the Earth, geosynchronous satellites appear to hover in a stationary position high above—perfect for global communications. And in 1965 Early Bird flew, the first commercial communications satellite: it was parked 22,300 miles above the Atlantic and could handle 240 phone calls or one TV channel between America and Europe. Click on the Connected Earth home page to learn more about how satellites fit into the remarkable communications progression from telegraphs to broadband. At the virtual museum of the Institute of Electrical and Electronics Engineers (IEEE), you can find information on the science of microwave communications, of which satellites are an integral part. Although Sputnik itself was too small to see with the unaided eye, many saw its discarded, protective shroud as it hurtled across the early night sky, reflecting the light of the sun. Today, you can go to NASA’s Satellite Tracking page page [science.nasa.gov/Realtime/jtrack/Spacecraft.html] to find out when some of the largest satellites might be visible overhead. The Union of Concerned Scientists has one of the most complete lists of all satellites orbiting today, with information on more than 800. In fact there are so many satellites in geosynchronous orbit above the Earth that there is a slowly evolving belt of these communication and weather satellites. To view this “geostationary belt” in motion, see Andrew Sinclair’s animation. The scientific contributions of satellites have also been immense. The first successful U.S. satellite, Explorer I, detected the Van Allen Radiation Belt, which traps charged particles from the Sun. But the radiation belts are still being explored, with each generation of spacecraft adding more details to our understanding. To learn about current efforts, which employ a small fleet of satellites, see the NASA page on the Radiation Belt Storm Probes Mission. Last, but not least, there is a page devoted to the SuitSat, where I learned about a junked spacesuit that was deployed from the International Space Station. Equipped with simple transmitters to relay temperature data, its signals could be tuned in at 145.99 MHz—like Sputnik with arms and legs. How far we have come!